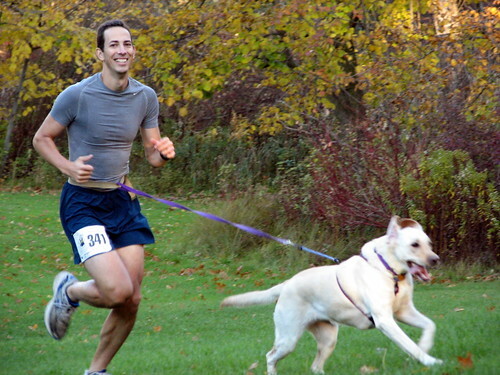 My favorite race of the year is Bailey’s Doggie Dash 5K, a cross-country run for owners and their dogs to benefit the Kent County Parks Foundation. 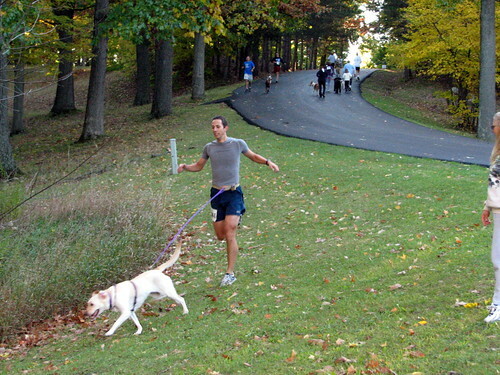 It’s not a large race, usually drawing around 50 participants, but it’s very well organized and one of the best races around where you can run with your dog. 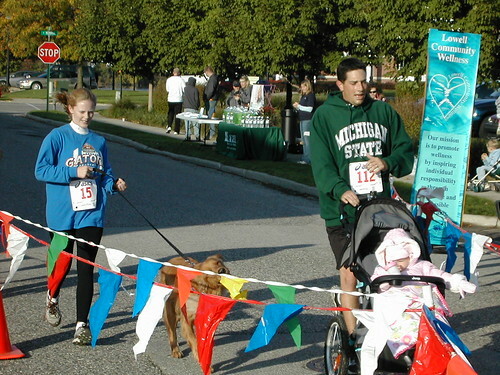 Haven and I first ran the Doggie Dash in 2005 as my first ever organized running event since high school. That year we finished 10th overall in 24:39 and won my age group by virtue of being the only one in my age group (after they pulled out the overall winner, who had tied the course record in 18:17). 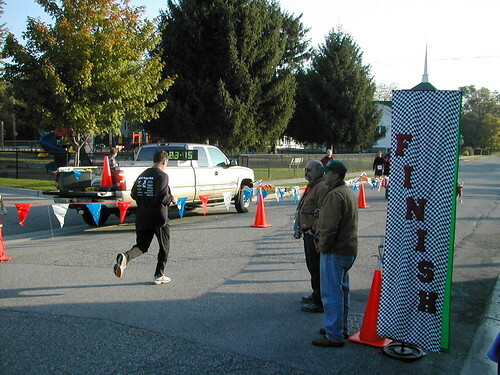 In 2006 we improved to 5th overall, dropping nearly two minutes off our time with a 22:42 finish and winning the age group, this time a “large” group of four runners. How would Haven and I fare this year? Just last week I set a post-high-school 5K PR of 20:56 in the Harvest Hustle so I knew I was better prepared to keep up with Haven in this year’s Doggie Dash. But I also had a plan to use canicross tactics – rather than hold Haven’s leash in my hand, I instead tied it to a belt around my waist so Haven could help pull me along. Haven and I trained in this setup for a few weeks before the race to make sure we both felt comfortable. I learned that it was necessary to have some form of shock absorption so I clamped an automobile tie-down bungee between Haven’s harness and the leash – it worked like a dream. Saturday morning arrived bringing perfect weather – mid 40’s, clear blue sky, and near-peak fall colors that yielded some stunning photos by Amanda. 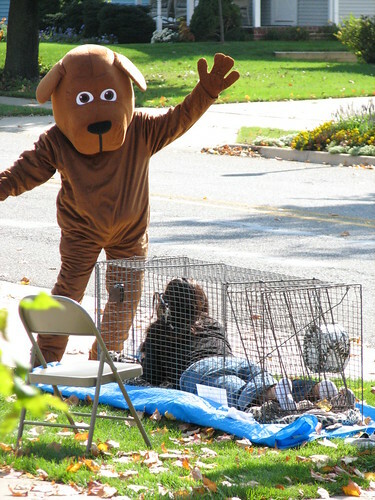 The Doggie Dash sports a Halloween theme with a dog costume contest judged by the local weatherman and registration SWAG handed out in trick-or-treat jack-o-lanterns. I think Haven remembers previous races – when everyone began lining up for the start this year one guy took off on a warm-up jog and Haven must’ve thought the race had begun. Haven started screaming in anticipation as I tried to calm her down – it was so cute and she was getting lots of smiles from the crowd. At last it was “Ready, set, GO!” and we were off! 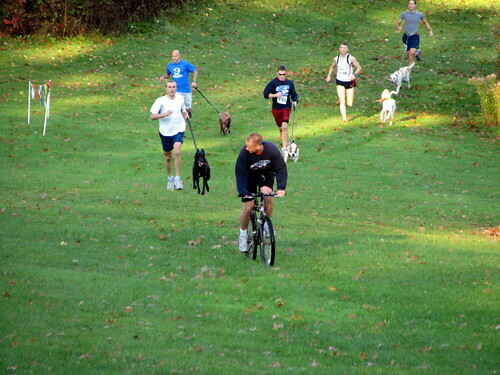 The race director pedaled a mountain bike ahead of the lead runner to give his dog something to chase, a very keen idea. Haven bolted full steam ahead and we quickly settled into fifth position. One of the most difficult sections of the course was the beginning because it was downhill and paved – with Haven full of energy dragging me downhill, it was all my legs could do to simply not let me fall flat on my face! My feet and legs took quite a pounding right off the bat. Next we slogged through a scenic wide-open lawn that was saturated with water and then up a short road to a wooded picnic area. Just before reaching the one-mile marker Haven and I passed two racers who were fading after a quick start. 20 yards ahead was a guy who looked way faster than me but I sped up a bit to keep close to him so that Haven would have someone to chase. She loved it, almost too much! Whenever we rounded a bend Haven tried to cut the corner inside the course flags – she wanted to intercept the runner we were chasing. I repeatedly had to remind Haven to follow the rules but she didn’t want to hear it. 🙂 Every turn we’d lose 5-10 feet on the guy ahead of us since I’d have slow up to pull Haven outside the marker flags, but then we’d hustle to regain the lost ground. At the 1 mile mark I was shocked to see 6:20 on my watch! Haven was definitely doing her part and it was fun to still have the leader in sight although I knew it wouldn’t last. Down a slight hill the course turned off into a wooded section of singletrack for a 1/4 mile before heading out and around the beach playground. Here Haven kept trying to stop for a drink in the large puddles of water pooling in the sand. I obliged her at one of them and she tried to lie down in the water to cool off! Sorry Haven but we have to finish the race first! After the beach we ran along a dirt road and then onto a paved loop that carried us through the park’s campground. 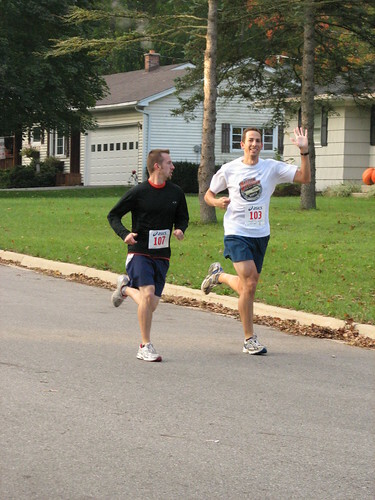 We were still close to the #2 runner at the 2 mile mark – our second mile was run at a 6:30 pace! I was getting pretty excited but I also knew that one or both of us were going to hit the wall soon. With about half a mile to go as we approached a long hill Haven began to fall behind. Going up the hill we reversed roles as I found myself trying to pull Haven along! I tried yelling “RABBITS! !” to her, a word that usually gets her all spooled up (she LOVES to chase rabbits) but she was to tired to care. Finally at the top of the hill we had just a 1/4 mile to go and I still couldn’t get her to pull even with me. Even though I knew we were losing time quickly, this wasn’t my race – Haven was every bit a part of this effort and it wouldn’t be fair to speed up and drag her to the finish. I did keep the pace fast enough to maintain some tension – I figured I might as well help her out a bit without pulling so hard as to bunch the harness up around her head. Finally in the last 100 yard grassy home stretch I tried another “RABBITS! !” but Haven was done, so we maintained our pace to the finish for a very satisfying 3rd place overall. Better yet was our time: 20:17! That was the second-fastest 5K I’ve ever run in my life, even though I had some help. My high school PR was 20:08 and my next-best teenage run was 21:13. Haven is my hero! 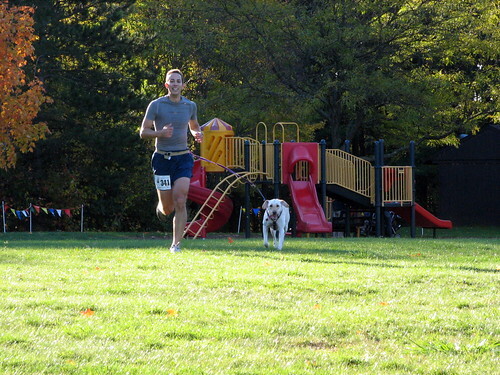 Seriously, Haven was the hardest-working dog at the race. Both runners who finished ahead of us had humans that were much more fit than I am while their greyhound-mix dogs were running alongside on a slack leash; i.e. the guys who beat us did so without the canine assistance that I needed. Some other dogs behind us were certainly pulling their owners, but at 195 pounds I was probably the heaviest human cargo to be mushed by any dog. Those greyhounds couldn’t have outrun Haven if I was dragging them down! 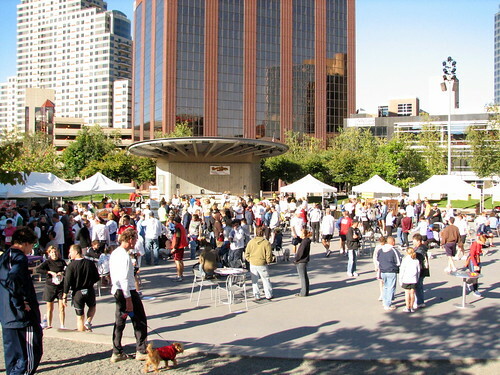 Post-race food was great – bagels, cookies, candy and cider for the humans and water and doggie biscuits for the canines. Naturally Haven got to eat first before I took a crack at the goodies as we watched the rest of the field finish with the song “Who Let the Dogs Out” blaring on repeat over the loudspeakers. After everyone finished we were treated to a demonstration of frisbee dogs by Pawsitive Vybe‘s professional dog trainers Apryl Lea and Ron Sutton. Spectacular show! 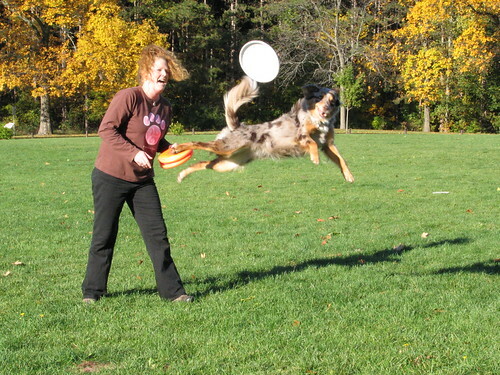 Six dogs (IIRC) displayed their talents and some of them were insanely good leapers and blazing runners. Following the frisbee demo was the awards ceremony. Some very nice handmade dog beds were raffled off and for the third year in a row, I didn’t win one. One guy that did win a bed and a free pair of shoes was Ron Durham who drove all the way from the east side of Michigan. 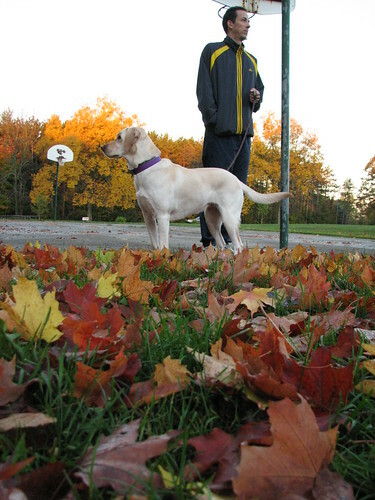 The reason I mention Ron is because he adopted his golden retriever Kasey thanks to reading my blog! Despite our 3rd place overall finish Haven and I wound up taking 2nd in my age group as the guy we’d been chasing for two miles is in my bracket. 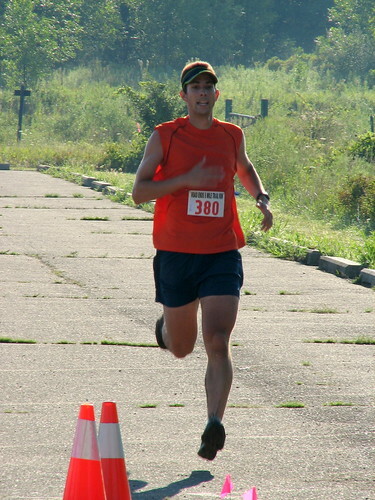 In fact the overall winner Joel Bierling – who also won in 2005 and 2006 – is in my age group, too. Men 30-35 were representin’ at the Doggie Dash! There was no way I could’ve caught either of those fast runners, but in retrospect I probably could’ve helped Haven and I get a faster time if I’d managed Haven’s workload more effectively. For the first mile there was nothing I could do but hang on for the ride, but mile 1.5 through 2.0 I should’ve quickened my pace a tad to ease the drag on Haven; that way she may have sustained her energy long enough to keep the both of us on the tail of the #2 finisher for another half mile until finally running the last half mile with a slack leash and not having to pull her. 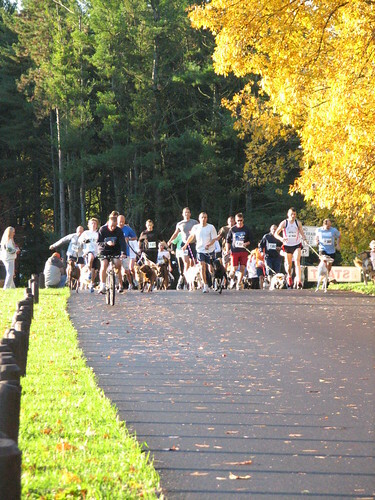 Nevertheless, we ran an awesome race, had a ton of fun, and we’re already looking forward to the 2008 Doggie Dash! 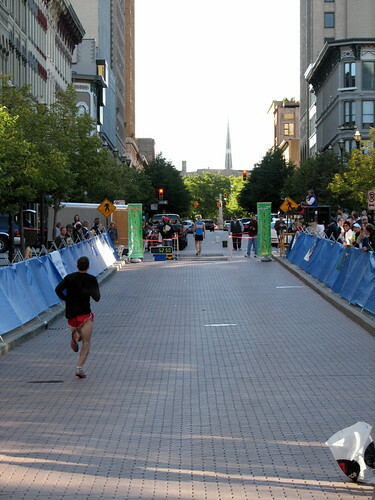 The finish of the 2007 Chicago Marathon was absolutely THRILLING – here’s a video of those two runners sprinting for the finish. Ivuti wound up winning the race over Gharib by a scant fraction of a second. Can you imagine running your heart out for 26.2 miles and then having to sprint the last 1/4 mile? Wow. I love to finish races like this, by kicking hard for a short final stretch to nip somebody at the line, even though I’m never a contender for any placing. Racing is fun. 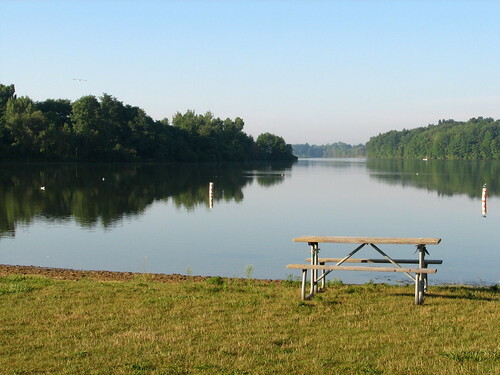 After all of my races – whether it’s a 5K or 50-miler – my mood is elevated for at least the rest of the day. I can’t explain why, but there’s something exciting about being part of a race and not just going for a run. Maybe that seems superficial, but for me it works. 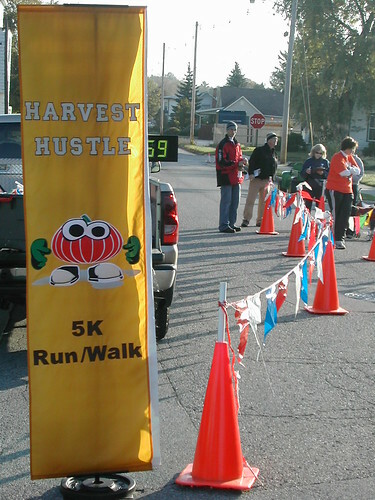 Next up on my calendar is the Harvest Hustle 5K in my hometown; in fact the race course passes within a couple hundred feet of my house! 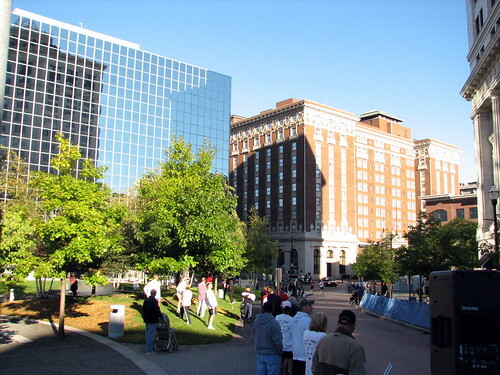 The steep hill up which I sometimes run repeats is part of the opening mile of this race so it’s going to be a painful couple miles after making the climb. 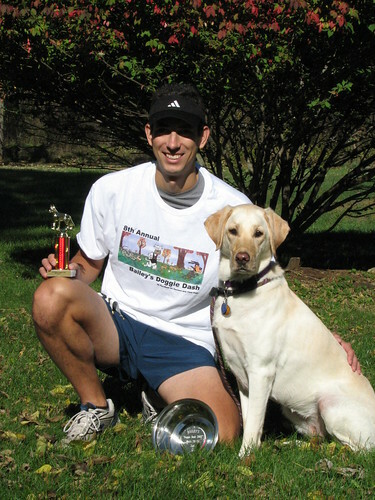 Just a week later my dog Haven will be joining me for the Bailey’s Doggie Dash 5K, a race that I’ve run the two previous years. It’s always one of my favorites, if not my very favorite race. 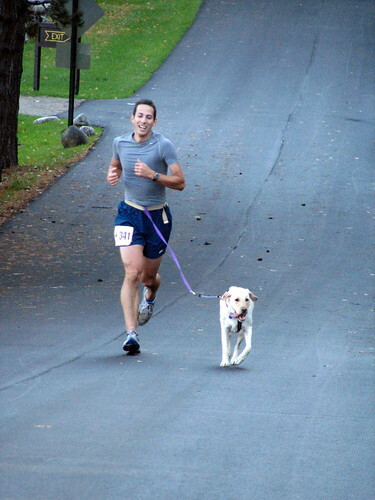 It’s such a treat to run a race with my most frequent training partner as well as meeting lots of other furry friends and their owners. 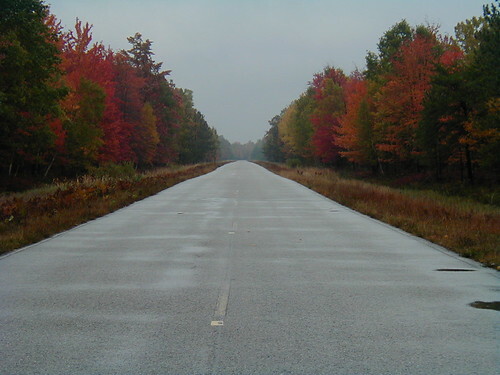 Usually it’s a very scenic time of year but this year’s drought has stressed the trees into dropping their leaves early, so it might not be as pretty as in previous races. Those aren’t the only two races left on my calendar for this year, but I still haven’t decided what else to run. 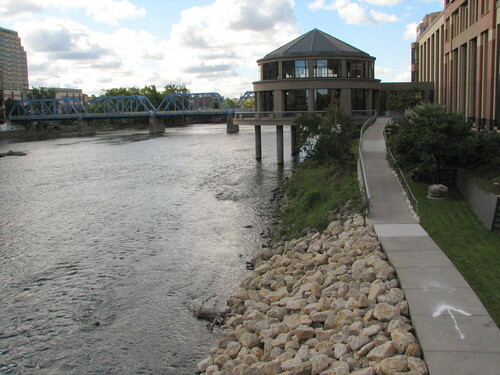 Know of a fun event in Michigan?